We opened a studio in downtown Mobile, Alabama about a year ago, and it has been such a joy getting to know a new city. Mobile is so much more than I expected. I anticipated a very genteel Southern city, stepped in tradition and shaded by towering live oaks and magnolias; a slower and softer pace of living, beautiful manners, and lots of old bricks. And all of that is definitely there, and wonderful to see. But what I wasn’t expecting to find was a city brimming with a barely-contained sense of humor, quirky shops and restaurants that I would have expected to find in Austin or Portland (but not in stately Mobile! ), and an overwhelming feeling of joy. Karen and Jeff’s downtown Mobile wedding showcased all of this. They chose The Steeple on St. Francis as their venue – if you can’t seen this place, do yourself a favor and check it out. It’s a huge, deconsecrated church that dates back to 1842. 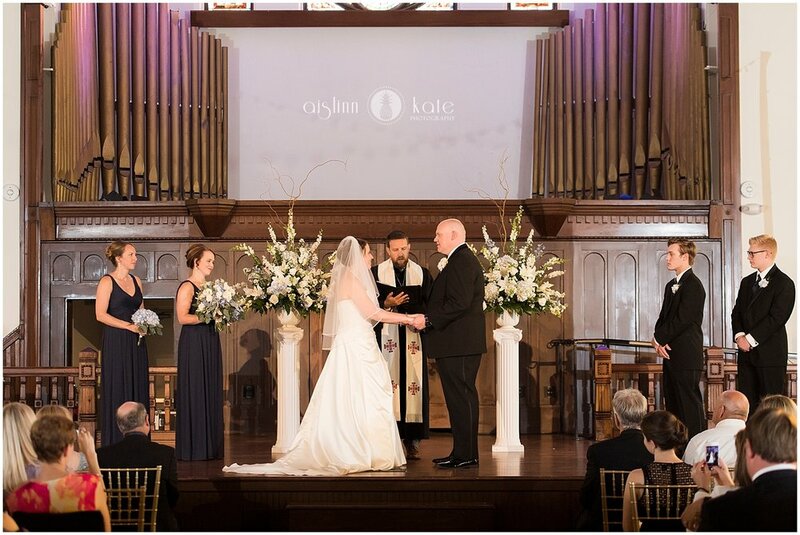 After sitting vacant for some time, it was lovingly restored and rebirthed as an event venue, hosting concerts, meetings, and weddings in the large hall under the glow of the original stained glass windows. It is truly spectacular. While Karen and Jeff’s guests enjoyed cocktails in the lounge area downstairs, we spent a little bit walking around downtown taking photos. In what I am learning to see is true Mobile fashion, the main section of Dauphin Street was closed down for an annual pole vault competition; while collegiate and high school athletes ran down the center of the street and vaulted high the air, hundreds of Mobilians drank beer, ate tacos from food trucks, listened to music, and cheered them on. Also, one sweet, newly-married couple (and their photographer! ), shouldered their way through the crowds and took a hilarious and awesome set of street photos while well-wishers shouted congratulations. It was a beautiful day, full of love and laughter, dancing and confetti. THANK YOU Karen and Jeff for asking me to be a part of it!